Our attitude towards time, is the attitude we treat our life. When time passes along the ticking of hands, life will teach us what is the real desire in our life. Reef Tiger Classic Prophet accompanies you all the way forward in time, eventually achieve your dream. Reef Tiger Classic Prophet interpret the true meaning of timepiece, 40mm diameter can fit the wrist of most men. The watch has simple lines, the dial is clearly readable, very suitable for low-key and elegant business men. 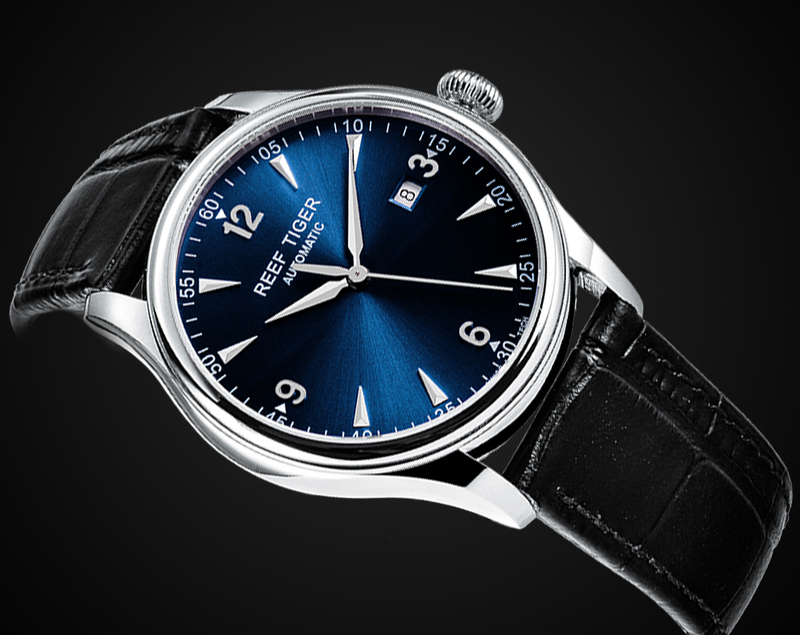 Enamel dial is noble and elegant, plain color brings a different kind of freshness. The hour markers use Reef Tiger’s classic stick markers, the logo at 12 o’clock is also enamel material, the overall feeling of the dial is clean and elegant. The case features double bezel, which looks more three-dimensional when viewing from the side, dust proof stainless steel has a high quality texture, screwed crown is exquisite, it exudes innate elegance and unified gorgeousness. The rectangular window at 3 o’clock is used to display the current date and day, the overall dial layout is orderly and harmonious, the background of date window forms sharp contrast with the dial color, very easy to read. Your shiny moment every day will be remembered by Prophet. The middle part of the hour and minute hands is solid, willow leaf-shaped hands are romantic and elegant. The arc which hour hand crosses will witness the most beautiful moment and the best time in your life. In order to adapt to different occasions, the 7-link steel bracelet or two tone bracelet is business style.